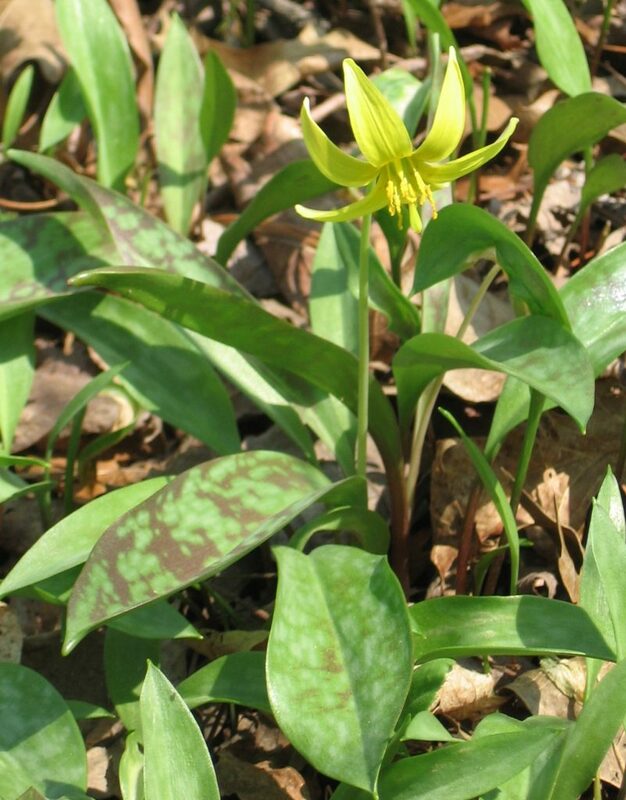 Erythronium americanum is a perennial monocotyledon, spring ephemeral herb from deep corms 1.5–2.8 cm wide (bulb-like storage root), floral stem 10-20 cm tall about half underground; extensively colonial from corms produced at the ends of 1-3 short (10 cm) rhizomes from each corm (Flora of North America 1993+); new roots and shoots produced beginning in late summer through late autumn (Risser and Cottam 1968); roots associated with VA mycorrhizas, these begin colonization at the beginning of root growth and end when roots dies off in early summer (Brundrett and Kendrick 1988). 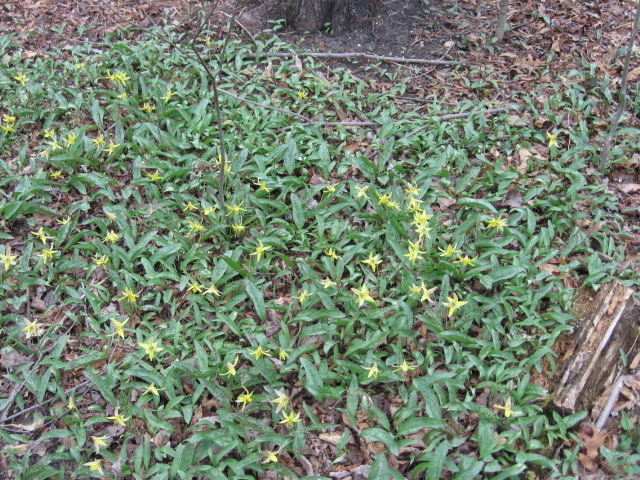 Erythronium americanum plants in bloom. April 2014.2 (Accessed 8/2018). 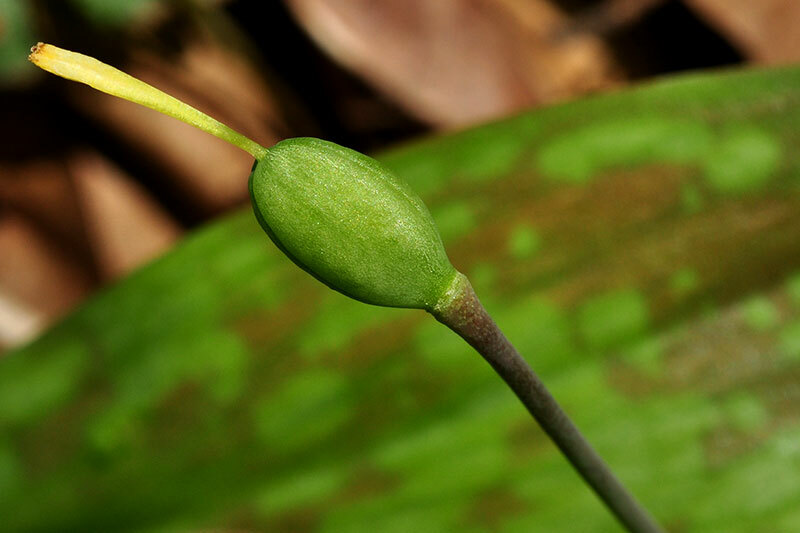 Leaves 1 or 2, arising from underground part of stem, appearing basal, 8-23 cm long; small, non-flowering corms produce only 1 leaf; surface pale blue-green, extensively spotted with dark blotches; appearing early April, when soil temperature rises above 0ºC (Collins et al. 1985); leaf life span 11 weeks, emerging in April and senescing in June. Flowers yellow with darker markings on back, petals and sepals (tepals) alike, 3 each, 2-3 cm long, free but converging at base, strongly bent back in bloom, stamens 6, ca 1 cm long, style 0.5-1.0 cm long, ovary superior; flowers produce nectar, pollinated by bees (Andrena nigrihirta, A. tridens, Apis mellifera and others, also including an Oedomerid beetle Asclera ruficollis), (Motten 1986; H. Zirlin 2017 personal communication); inflorescence of one nodding flower. Erythronium americanum.young fruit.Delaware Wildflowers.bing images.com (Accessed 8/2018). Erythronium americanum seeds and fruit.Sottish Rock Garden Club.srgc. (Accessed 8/2018). 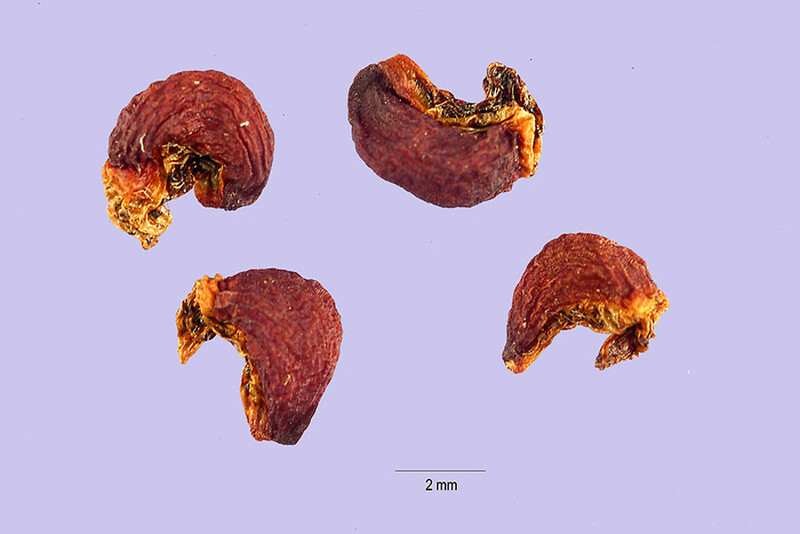 Fruit dry, a capsule 1.2-1.5 cm long, uncommon, held off of ground; numerous seeds with fatty growth (elaiosome) adapted for ant dispersal; ants probably including genera: Aphaenogaster (A. rudis), Myrmica, Formica and Lasius (Beattie and Culver 1981; Handel et al. 1981). Seeds eaten by Mice, birds and insects (Martin et al. 1951). Dispersal to and establishment in new sites in successional forest, contiguous to old regrowth stands has been calculated at a rate of 1.29 m/yr (Matlack 1994). 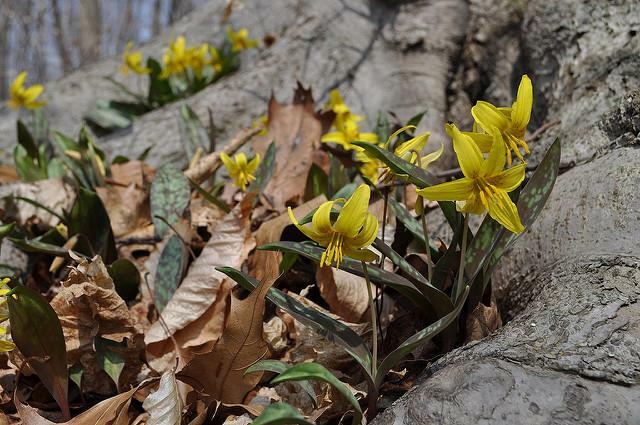 Erythronium americanum. seed.By Tracey Slotta. USDA-NRCS Plants Database – plants.usda.gov (Accessed 2/2015). Habitat: Herb layer of undisturbed moist woods, (Wein and Pickett, 1989). Found in soil pH 5-6 (Gargiullo unpublished data). Requires at least 120 days of cold before growth will begin in the spring (Risser and Cottam 1967). Not shade tolerant, requires high light levels before canopy closure for efficient photosynthesis, senescent by mid-May or early June (Taylor and Pearcy 1976). During the short growing saeson, starch contents of the corm rises from about 11% to about 60% dry weight after which it begins to drop. Conversely soluble sugars drop from a high of about 16% in late March to about 2% at senescence, in early June. 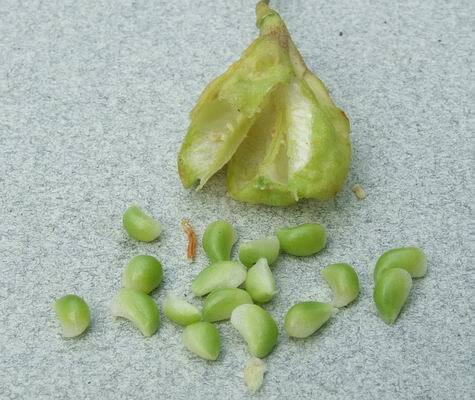 Storage of photosynthate as starch may enable bulbs to remain dormant during summer (Hicks and Chabot 1985; Risser and Cottam 1968); most reproduction vegetative, mean number stems per colony 107 (Bierzychudek 1982). Requires at least 1% full sunlight to survive (compensation point), but cannot use more than 25-50% full sun (saturation) (Hicks and Chabot 1985). Spring ephemerals may temporarily store nutrients (Nitrogen and potassium) during spring, that become available later for summer green species after spring ephemerals die back (Muller and Borman 1976).